Within the aquarium, fish and uneaten food produce waste which breaks down to form AMMONIA (NH4). Aerobic bacteria within the filtration system of the tank then oxidise the ammonia first to NITRITE (NO2) and then further to NITRATE (NO3). This series of processes is continuous and ultimately leads to a build up of nitrate in the aquarium which can only be reduced without a nitrate filter by either large regular water changes, heavy aquatic planting or by a reductive process whereby the oxygen from the nitrate molecules is utilised by anaerobic bacteria to convert it to NITROGEN GAS (N2). The natural reduction of nitrate to nitrogen gas will only occur if there is an area within your system with a very low oxygen level that will allow anaerobic bacteria to exist in sufficient quantities to handle the waste that is being produced by your tank s inhabitants, such as within live rock or in a deep sand bed. Where this does not exist it is necessary to create such an environment and this is where the ADI denitrification reactors come in to play. ADI Reactors offer a large surface area on which millions of anaerobic bacteria can colonise, a system of recirculation of the water to ensure that the nitrate is easily available to all of the bacteria and a way of introducing a carbon based food, (alcohol) to feed the bacteria which allows them to multiply and to remove the nitrate from the water column. Keywords : Aquarium Accessories, Aquarium Nitrate Reacter. Need advice or a second opinion? Want to upgrade your system? We offer on-site consultancy and advice for domestic and corporate clients. 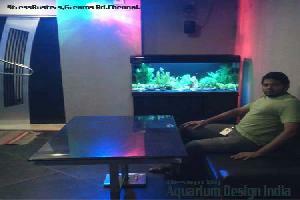 Our expert staff can sort out almost any aquarium problem. © 2011 by Aquarium Design India.